In an hour and a half, Skyteam member CSA flies us direct from Amsterdam's airport to Prague's Ruzyne airport in the Czech Republic. 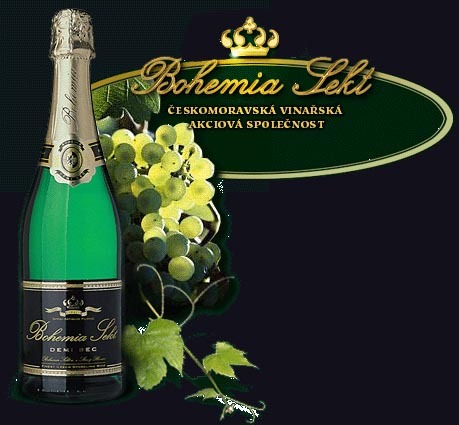 On board, we get excellent service and have our first encounter with the Czech language and the Bohemia Sekt [bubbly]. Eunice Kron of KR Audio warned us ahead of time that it's never advisable to pick up a taxi at the airport. Either proceed instead to a special desk at the airport and let them get you a ticket for a taxi or have one already waiting for you. We arranged for a taxi via the hotel we would be staying at. With only carry-on luggage, we got through customs smoothly and found our driver in the arrival hall. He took us to his car a few meters further on, a shining Skoda Octavia stickered with "It happens at the Hilton". A little kamikaze drive through the outskirts of Prague and along the river Vltava/ Moldau later and we arrive at our hotel. We were booked into the executive floor and registered. Whenever you visit Prague and have outgrown the backpacker stage, the Hilton's your place to stay. It's been completely redecorated after the severe flooding of 2002 and is one of the few hotels with an atrium sans safety nets. Jumpers are welcome but why would you? From our room, we have a partial view of the river and up the hills where the Prague television tower dominates the skyline. The restaurant of the hotel serves a perfect late-night dinner and we sample some more Bohemia Sekt. Service here is still spelled with a capital S.
The next morning, we take one of the hotel's waiting Skodas -- it appears the Hilton has its own fleet of squeaky-clean cars -- to drive us to the KR Audio factory. We leave the center of Prague and zip through the outskirts past large housing projects in communist gray prefab concrete style. It takes about 20 minutes and then we turn right and stop at Nademlejnska number 600. 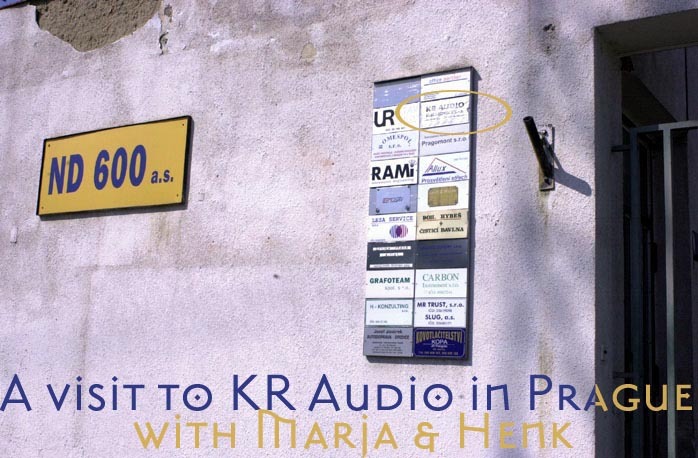 We find the concierge and try to explain to him in our best Czech that we are here to visit KR Audio. He makes a call and shows us how to get to our destination. We enter the building through a courtyard and ascend the terrazzo stairs to the second floor. The entrance reminds us of an old school, with wide stairs leading up and down. The atmosphere is filled with a smelly combination of bleach and industrial gases. At the top of the stairs, we are met by Eunice Kron. After a warm welcome, she leads us to her office. It is a warm day and Eunice's office is even warmer. Our hostess has certain things to finish and takes us along to a room stacked with familiar KR designs and parts. 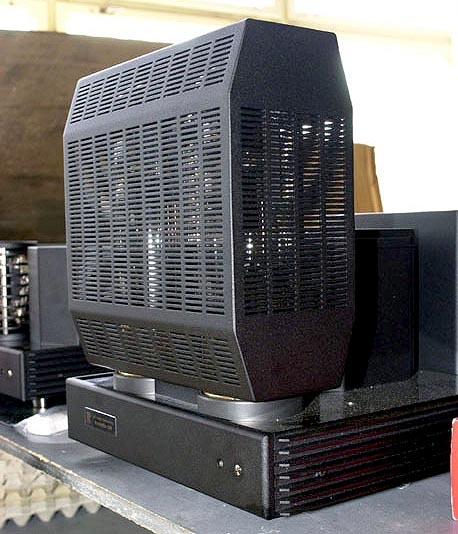 With pride, Eunice points at the latest KR Audio product, the integrated KR VT 340. 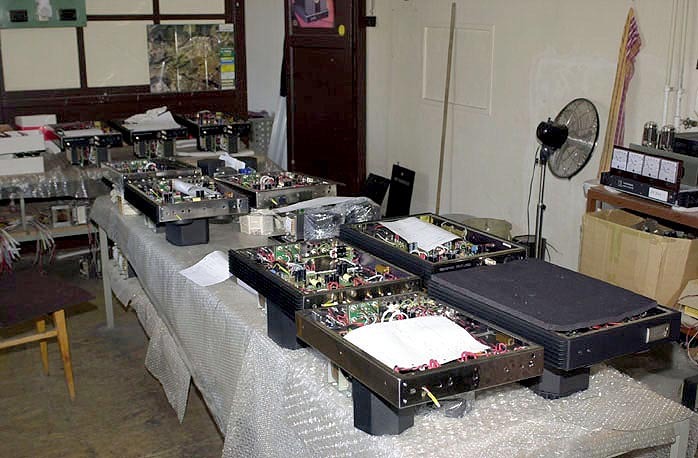 It is a combination of the P150 preamp and the Antares VT320 [below]. The amplifier is in its final test phase before dispatch to Holland. Holland? Yes, distributor Eurogram is the first customer in the world to receive the amp. And at this very moment that we are writing this, this amplifier is playing in our Rotterdam flat. We're in absolute awe. Expect the world premiere review on 6moons shortly. Also new but far less exciting is a metal cage to cover the 1610 tubes of the Kronzilla amps [right]. Some imbecile government agent has made it his project to save the precious hands of babies about to touch the glowing tubes so now the Kronzilla monster has to be caged. It is at this point that Marek Gencev enters the room and we meet. Marek is the young apprentice Ricardo Kron took on to first assist him with his work. When it became clear that Ricardo's time in this world was to end, Marek was groomed to succeed him. After great US coffee, me meet with Eunice's right hand, Buba. Buba is not only the Jill-of-all-trades, she's also fluent in Italian. Eunice, a born New Yorker, studied and lived in Italy for a long time and only ten years ago accompanied Ricardo to the Czech Republic. Now Eunice and Buba communicate in lively Italian and Buba translates (some of it) to the craftsmen and craftswomen in Czech. It is funny to be in a working environment where everybody calls each other Mister or Misses. It's like being thrown back in time - and maybe that is really the case. Eunice shows us around the factory and we follow the process of creating a tube from scratch. In this case, it's a KR 842 triode. The factory is basically split into two sections. One handles all gases and flames and the other all things electrical. A middle section houses assembly and carbonizing.